Welcome to Part 6 of the Great Refinishing Saga! In Part 2, I posited an idea. 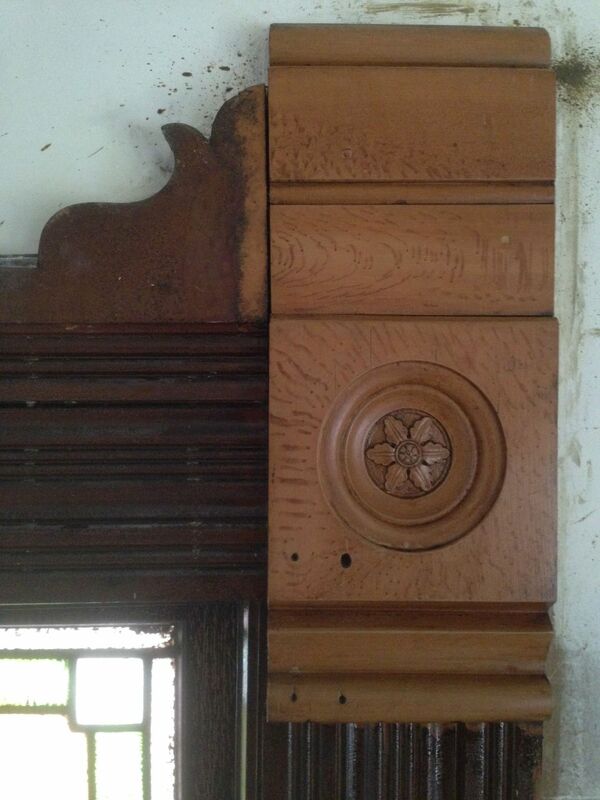 What if, if, I had actually uncovered the 1894 finish on my trim? And what if, if, the finish was not varnish or shellac on stained wood, but rather…a faux wood finish? NOTE: when I took the above image I had not finished stripping off the old finish. It now looks much neater. If I were to toss out a guess I would say that my trim is mahogany with a faux finish. This finish then later had shellac applied. After I removed the shellac I was left with the faux finish. 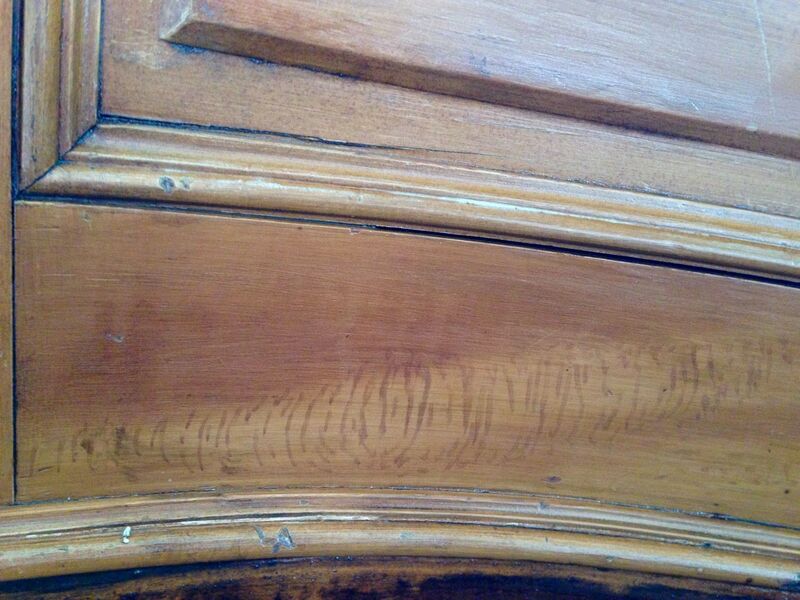 However, this makes no sense as stripping off the shellac would have also stripped off any faux finish. Because my brain could not process what I was seeing, I just kinda ignored this issue. But, I now have proof that my eyes won the bet. 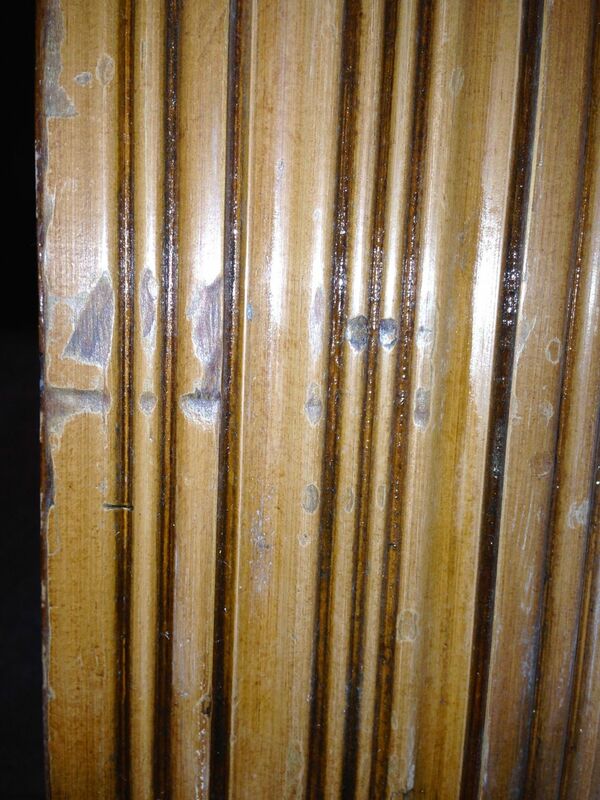 The original finish of the Cross House living room trim IS a faux finish. I have no idea what the underlying wood is. Nor can I explain how the 1894 finish survived my using paint stripper, and later denatured alcohol, on it. Neither of these caustic liquids made a dent to the 1894 finish. You know, I cannot explain electricity either (who can?) and just accept that it exists. ABOVE: This was the first incontrovertible clue. NOTE: the image is not distorted; the trim is at the bottom of one of the curved windows. A PAINTED FINISH. A painted finish which has reappeared after being hidden for perhaps a century, and it said: Hi Ross! ABOVE: More painted finish saying hello. ABOVE: And more painted finish. Hello! You can see how excellent the state of preservation is. Wow. Zounds. Gee willikers! 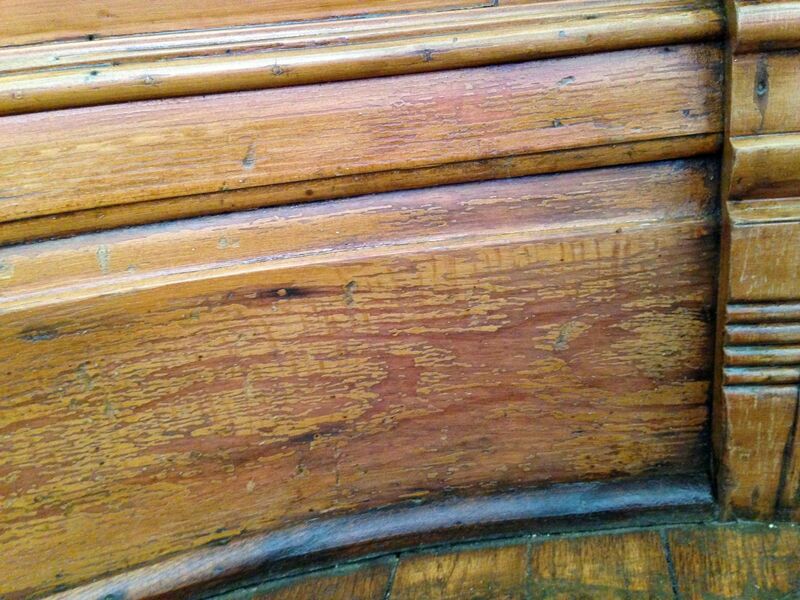 ABOVE: You can see how the 1894 faux finish has degraded, thus revealing the underlying wood. This is the only section which looks like this. 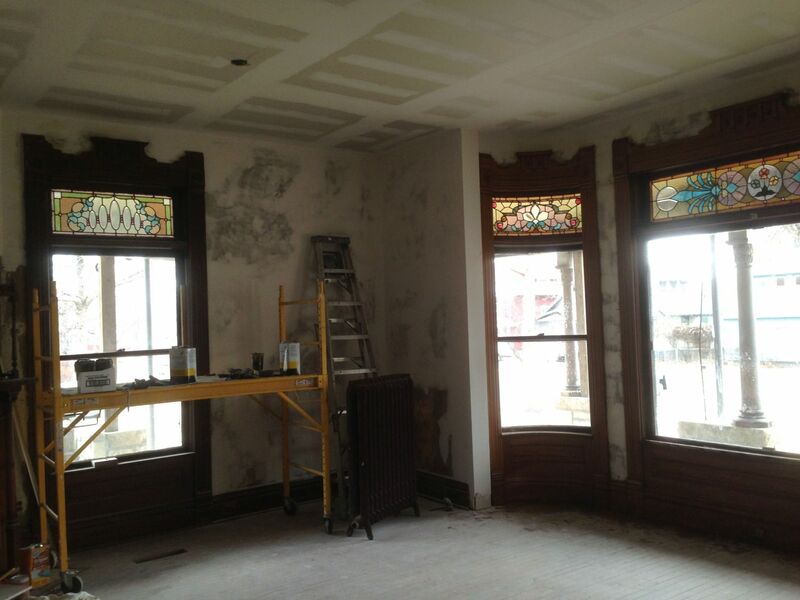 ABOVE: You are looking at the original 1894 faux finish on the window trim. Looks pretty good, right? 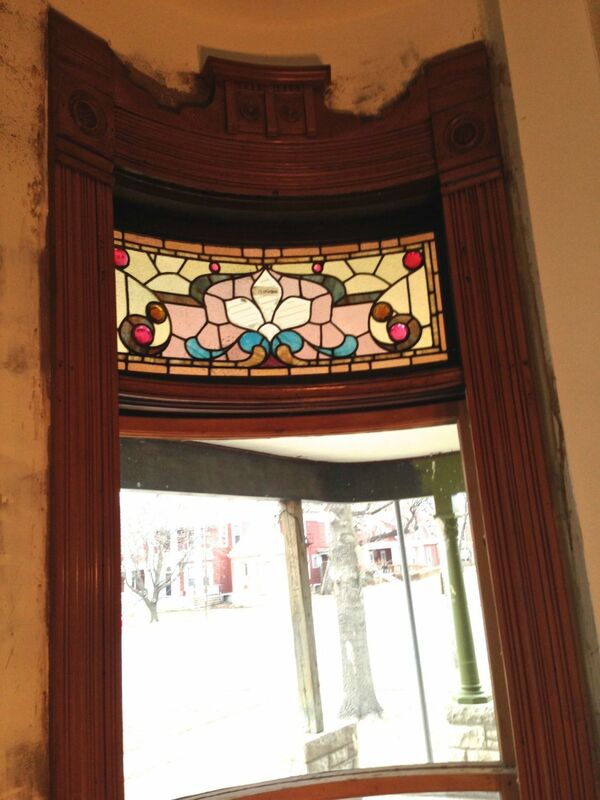 The dark finish I inherited is surrounding the stained-glass window. Big difference. ABOVE: It is really hard getting a good image with all the daylight. However, you can see over to the left the DARK trim I inherited. Over to the right is the now revealed 1894 faux finish, and so much lighter. Note also how much better the stained-glass looks not surround by an almost black frame. While my brain works slowly, it does, apparently, eventually process stuff. After much ado, and much fretting, it now seems that what I uncovered in Part I of this saga is the original 1894 finish. And it is much lighter than the very dark finish I inherited. And I love the finish. And I am amazed and stupefied that it is almost entirely intact, and was so very gracious to introduce itself. My plan is to finish stripping off all the later dark shellac, and apply one coat of new shellac. I might switch to varnish because it will not darken as much with age. 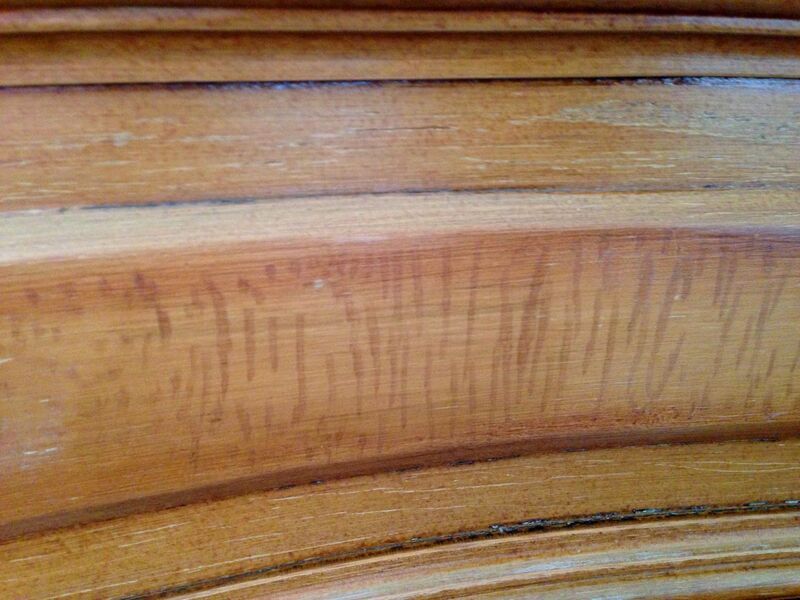 5 Responses to Refinishing The Wood Trim. PART 6. ANNOUNCEMENT! Could the faux bois finish have been done with milk paint? Yes, I now believe so. Only milk paint would have survived what I put it through! You got that right. I’ve used the really heavy duty stripper on it with no results. Trompe-l’œil at its best! Also one of the most extensive applications that I’ve heard of within structures. I’m by no means an expert on wood stains or finishes. But I have seen something like yours in a historic home in St. George UT. The pioneer settlers didn’t have access to hard woods, they had pine. In the grander homes they wood stain and paint the wood to look like walnut. Faux walnut doors, baseboards, paneling everywhere. I wouldn’t have noticed until the docent pointed it out.